Reviews of Books and Products from Amazon for Tripawds and their people. When a book with more pictures than words causes you to slow down, smile and ponder the special gifts that dogs bring us, you know it’s something special. The Year of Living Miraculously is definitely that book, and something to smile about. We were introduced to this book when the author, Eleanor Kas, contacted us after reading about the Tripawds Northern California Mill Valley pawty. The location for our pawty had special meaning for her, because her beloved rescue dog, Pulgacito, loved to play at that dog park. For people who visit the park frequently, there’s no doubt that Pulgacito made a pawsitive impact on them. Eleanor rescued Pulgacito at the age of 12. On the same day she brought him home, Pulgacito was diagnosed with a rapidly growing, disfiguring nasal tumor. Eleanor’s book, The Year of Living Miraculously, is a picture book and narrative that beautifully depicts how their relationship blossomed throughout Pulgacito’s illness and the precious gifts that it bestowed on them both. As Tripawd pawrents, we’ve all experienced the sideways glances and double takes from strangers who realize our dog looks different. From the pitiful “oh poor dog” comments to unwanted advice like “dog shouldn’t live that way,” when a stranger judges our dog based on a missing limb, it’s easy to pick out the more enlightened people who have already learned that dogs and humans alike are comprised of so much more than outward appearances. Through photo essays of Eleanor and Pulgacito’s one year relationship, the book vividly demonstrates the mysterious powers of love and how if we slow down long enough to surround ourselves with those powers, they can change our life forever. We highly recommend this book! Pulgacito, an elderly pit bull mix, is among three dogs found in a San Francisco crack house on Valentine’s Day, 2007. The dogs are seized and impounded by the SF County Department of Animal Control where they are scheduled to be put down. In the final hour, Pulgacito is rescued, and makes his way to the affluent Marin County suburb of Mill Valley. The day he arrives to his new home, he is diagnosed with a severely disfiguring and debilitating nasal cancer. What follows is a journey of heartache and inspiration wherein the author makes surprising discoveries about everything from public attitudes toward disfigurement and illness to Pulgacito’s own logic-defying vibrancy and mettle. This pictorial story originally written as a thank you to the veterinarians, technicians, dog walkers, and house sitters who played vital roles in Pulgacito’s year of living miraculously is a tribute to an old dog who remained undaunted by a crippling disease and threw himself wholeheartedly into the brief but very eventful new life before him. As such, it is a tale with relevance to us all. Start your Amazon search here to support the Tripawds community! Shop Amazon to Keep Tripawds Online! Save on Prime Day to Support Tripawds! 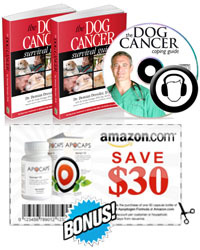 Get Dr. Dressler's Dog Cancer Survival Guide, e-book and more and save with Apocaps Coupon! Tripawds Amazon Selections © 2019. All Rights Reserved. Tripawds Amazon Selections is brought to you by Tripawds.